2015 Trophée Eric Bompard was cancelled in the wake of the attacks that took place in Paris, France, on November 13, 2015. There will be no medal ceremony at Trophée Eric Bompard in light of the horrible attacks that were waged in Paris, France, on November 13, 2015. In attendance at the quickly-organized meeting were skaters such as Patrick Chan, Tatiana Volosozhar and Maxim Trankov as well as coaches, officials and journalists. Earlier in the day, a press release was distributed announcing that the event would continue. Increased security measures including bag checks were implemented at the venue in the morning. Later in the morning however, the minister of interior affairs of France, Bernard Cazeneuve, and the Mayor of Bordeaux, Alaine Juppe, informed organizers that the competition had to be cancelled. The announcement was followed by a moment of silence and a stirring recital of the French national anthem that brought many to tears including French skaters Vanessa James, Maé-Bérénice Méité and Morgan Ciprès, as well as Russian coach Nina Mozer. The announcement of the cancellation and recognition of the tragedy in Paris triggered a release of emotions among many of the athletes, particularly members of the French figure skating team who had been trying to operate in “business as usual” mode since last night. Méité learned the news of the late-night attacks in the morning. The two-time French champion checked in with friends to ensure their safety. “It’s hard to speak. I have no words about what happened yesterday,” said French pair skater Ciprès, who was overcome by emotion and embraced by Méité before departing the meeting. The decision to cancel the event struck an emotional chord in the Olympian who had been trying to maintain composure all morning. “It is a shame also for the other athletes, the Russians, the Canadians, everyone who came here to skate for the Grand Prix Final who worked hard,” she added. But, James was buoyed by the level of support from her competitors. Like James, Gailhaguet also observed the palpable camaraderie among the skaters. 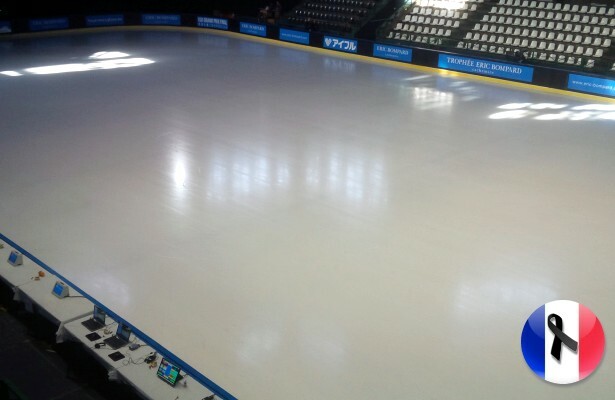 The cancellation of the grand prix event puts skaters seeking points to qualify for the final in uncertainty. Following Gailhaguet’s announcement, Peter Krick, the ISU’s sport manager of figure skating shared a proposal. At this announcement, Canadian Patrick Chan, who was in fifth place following the short program, made eye contact with his coach, Kathy Johnson who politely sighed. With aspirations of moving up the rankings in the free skate, a fifth-place finish at Trophee Eric Bompard combined with his first place finish at Skate Canada International would garner 22 points for Chan and make qualification for the final questionable. In James’ case, the skater with grand prix final hopes is pleased at the prospect that she and partner Ciprès could finish second if the ISU adopts the proposed standing decision but she is still uneasy. James recognized that the tight scoring between the pair teams ranked second to fifth after the short program meant the free skate would be important.